Davis Sayer in action for Peterborough Town. 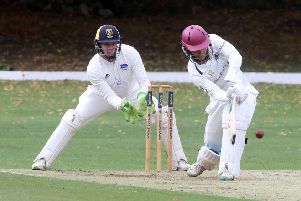 Sayer (20) was called up to the first team for the first time after impressing in second team cricket for the county this summer. He followed in the footsteps of elder brother Rob who has just been released by Leicestershire after making 11 first-class appearances. Sayer scored six and 21 (20 balls) batting at number 10 in an innings defeat for his county. He returned figures of 0-28 from five overs in Warwickshire’s only innings. Sayer bowls quick left arm and was part of Leicestershire’s Academy until suffering a serious back injury a couple of seasons ago. He has taken 22 wickets at 27 apiece for Peterborough Town in the Northants Premier Division this season. Warwickshire’s team included England internationals past present Ian Bell, Jonathan Trott and Chris Woakes.